Whether due to the vast distances separating Australia from the rest of the world or merely general apathy, popular understanding of the native Aboriginal culture of Australia remains limited. Beyond stereotypes and simplifications, often combining the native peoples of all non-European cultures into a single homogeneous amalgam, general knowledge concerning the Aboriginals is often minimal. In spite of this lack of attention or wider interest, the Aborigines inhabiting ancient Australia were actually part of a rich eco-system and even richer culture, producing impressive artwork, complex religious and communal systems governing relations, in addition to technological innovations far beyond those of their pre-historic European and Asian cousins. Wandjina rock art in the Kimberley region of Australia. The University of Queensland. 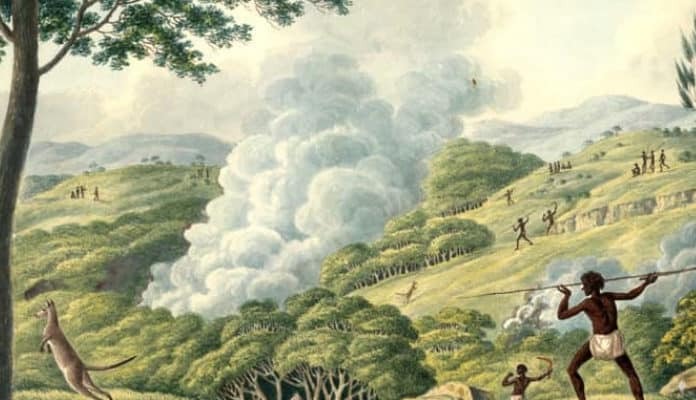 Artwork depicting the first contact between the Gweagal Aboriginal people and Captain James Cook and his crew on the shores of the Kurnell Peninsula, New South Wales. Wikimedia Commons. Whilst only speculation, albeit reasoned and supported by the genetic and geological information available to us, it is generally believed that humans have occupied the island of Australia since between 75,000-50,000 years ago. Stemming from early African migration, DNA analysis strongly supports the conclusion that Australian Aborigines descended from a single human population which departed Africa sometime between 64,000 and 75,000 years ago; this migration consequently would have occurred approximately 24,000 years before humans from Africa migrated into Europe and Asia. In a split that would see the first human populations leave Africa, recent genetic examination has determined a founder population of between 1,000 to 3,000 women would have been necessary to provide the genetic diversity among the fledgling civilization that can be observed today. For reasons unknown this migration suddenly stopped about 50,000 years ago; as a result, ancient Australian Aborigines developed in near-total isolation from the rest of the world and are likely the oldest indigenous peoples outside of Africa itself. The earliest place determined to have been inhabited by humans in Australia dates to around 55,000 years ago: the Malakhunanja II rock shelter located in the Northern Territory of modern-day Australia. The earliest human remains discovered in Australia were found at Lake Mungo, in New South Wales, and dated at around 42,000 years old, confirming the existence of populations in Australia by that time; additionally, the identification of ancient artifacts from between 6,500 to 30,000 years ago clearly demonstrates human occupation of these parts of Australia, particularly at Rottnest Island, during this time. Further assisting in the isolation of these migrants, the land bridge between Australia and New Guinea was eradicated approximately 8,000 years ago by rising sea levels; DNA analysis of the native populations of both islands reveals a close connection, suggesting significant interaction prior to this environmental separation. A male Aborigine carrying a hunting spear (1922). Wikimedia Commons. Whilst information is naturally limited in scope concerning the earliest inhabitants of Australia, it is widely believed and supported that the Aborigines existed as hunter-gathers: that is to say they subsisted through the hunting of animals and the collection of plant-foods; this method of survival was common throughout early human history, with up to 90 percent of human history experienced in this manner and agriculture only first discovered during the Neolithic Revolution approximately 12,500 years ago. It is also asserted that these early Aborigines were nomadic, as also was typical for hunter-gatherer communities due to the seasonal requirements of food chains and the need to allow the land to repopulate itself to prevent man-made extinctions. Among the locations known to archeology as sites of early Aboriginal habitation are Lake Mungo, Kow Swamp, Coobool Creek, Talgai, and Keilor. Interestingly, the bones of Aborigines born between 40,000 and 10,000 years ago are considered to have been far stronger and more physically varied than their more recent descendants; this suggests the introduction of agriculture and the development of larger and more permanent settlements in the last 10,000 years, resulting in an increasingly secure and sedentary existence compared to that of a nomadic existence. The largest crater at the Henbury Meteorites Conservation Reserve. Wikimedia Commons. As with many ancient peoples who resided outside the so-called “known world”, Aboriginal Australians are generally believed to have not developed an advanced system writing akin to that used by European and Asian societies. Instead these cultures imparted stories and wisdom via the oral tradition, passed down within tribes and families often in the form of legends and folktales; without a written record of major events, like that which we enjoy from Ancient Greece for example, much of what we currently understand about the early history of Australia stems from these cross-generational stories. Among these stories, particular attention has been paid in recent years by researchers to Aboriginal disaster legends as indicators of significant geological upheaval or occurrences of note; the first notable success of this approach was the identification and confirmation of the Henbury Meteorite Field in modern-day Northern Territory, heralding into prominence the inclusion of Aboriginal oral tradition in modern scientific explorations. Found in 1899, it was not recognized as a meteorite impact site until 1931 after a connection was made with a local Aboriginal tale of a “fire devil” who struck the land there over 4,700 years prior. Since the Henbury revelation, the technique has also been applied to confirm a legend of the Gunditjmara people of modern-day Victoria regarding a massive flood; sediment and soil testing in 2015 strongly indicated an ancient tsunami covering the land several thousand years ago. Map of Torres Strait Islands. Wikimedia Commons. During the Pleistocene period, stretching from roughly 2.6 million years ago to 11,700 years ago, sea levels were far lower than they presently are, making migration from Africa to Australia, via Asia, much simpler than today. However, unlike the Bering Strait which is widely believed to have possessed an actual physical land bridge allowing humans to cross with relative ease, even during the Pleistocene period Australia was separated from the mainland by at least 90-100 kilometers of ocean; this transportation requirement means that the initial African migrants who crossed into Australia were, in fact, the first recorded oceanic travelers in human history. The precise manner or nature of the crossing is naturally unknown, but it is suspected rudimentary boats, similar to rafts and crafted from bamboo, most likely carried the migrants to their new home; it is generally assumed that a method of “island hopping” was employed as the means to ensure safe passage across the treacherous ocean waters to the uninhabited continent. Even more remarkably, due to the general consensus opinion of a single large human migration to Australia, it has been contended “that initial colonization of the continent would have required deliberately organized sea travel, involving hundreds of people”. Rather than merely accidental discovery, as occurred in the case of Iceland when Naddodd lost his way en route to the Faeroe Islands, and the gradual cumulative actions of individual families following suit, it would appear that the initial settlement of ancient Australia was a deliberate act and choice; what force might have compelled these individuals to attempt en mass the dangerous ocean crossing into isolation is impossible to guess, but more recent exoduses such as that of the Mormons in the United States or the Great Migrations of the early Medieval period, particularly that of the Turkic peoples, might provide clues as to the undeniably passionate motivations behind Aboriginal relocation to Australia. A Macassan wooden sailboat, of the kind used for the collection of sea cucumbers. Wikimedia Commons. Before the “discovery” of Australia by Europeans during the Age of Exploration, it is often believed that the Aboriginal populations of the island were completely isolated from the outside world; although predominantly true, limited commerce and external relations did occur between Aborigines and other nations, in particular with the Chinese, Indonesians, and until the collapse of the land bridge the neighboring island of New Guinea. The Torres Strait, a 150-kilometer wide channel dotted with islands settled by humans approximately 2,500 years ago, was easily navigable and cultural interactions between islanders and Aboriginals were not infrequent. Aboriginal oral history explicitly details legends of differently looking humans, seemingly of Chinese description but unquestionable not Aborigine, visiting coastal tribes ranging from Cape York to the Gulf of Carpentaria. Moreover, definitive proof was established when in 2014 archeologists unearthed an 18th-Century Chinese coin from the Qing Dynasty at a remote island in the modern-day Northern Territories; the use of Chinese coins as common practice by Aborigines in fishing was originally considered a modern cultural introduction, but this has now been called into question by the discovery. The presence of foreign coinage heavily suggests commercial interactions with visitors to the island; from Indonesian fishermen from the Spice Islands to Macassan traders from Sulawesi seeking to harvest or purchase sea cucumbers to trade with the Chinese, the evidence suggests consistent commerce and relations between the Aboriginal peoples of ancient Australia and the outside world. Even older coinage, with Arabic inscriptions and traced to 10th Century East Africa, have been discovered in Australia, indicating the possibility of even earlier contact with a broader range of other civilizations. A word cloud of Aboriginal words. Despite the absence of a formal writing system, the Aborigines were by no means unsocial, developing in excess of 250 separate and distinct Aboriginal languages prior to the colonization of Australia. In 1788, coincidentally the year of the first white birth in Australia, it was estimated more than 500 separate Aboriginal nations spoke in excess of a hundred separate languages using more than 600 dialects of said languages. Sadly, after a slow period of decline less than 20 such languages are spoken collectively by all the Indigenous peoples of Australia today; although some have been successfully preserved by linguists, others have been forever lost as they became extinct with dozens more highly endangered. More happily, however, many Aboriginal words have been transplanted into modern English, with more than 400 words adopted, most notably “kangaroo” which was picked up during Captain Cook’s visit to modern-day Cooktown for ship repairs; other borrowed words include koala, wombat, kookaburra, and boomerang, but several non-nouns have also been adopted including bung: an adjective for bad.